Imagine a ripe delicious strawberry being dipped through a flowing curtain of warm, melted Belgian Chocolate! 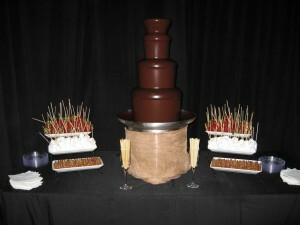 We have the best chocolate fountain rental Miami has to offer, Say “Good-bye” to the fondue pot! The Chocolate Fondue Fountain is an Innovative product that elegantly enhances any buffet, wedding reception, special event, by offering a new dimension of Chocolate Fondue! Your guests will be amazed as they dip strawberries and other delicious desserts through the flowing ”Chocolate Waterfall” and create Chocolate covered delicacies Imagine a ripe delicious strawberry being dipped through a flowing curtain of warm, melted Belgian Chocolate! Say “Goodbye” to the fondue pot! The Chocolate Fondue Fountain is an Innovative product that elegantly enhances any buffet, wedding reception, special event, by offering a new dimension of Chocolate Fondue! Your guests will be amazed as they dip strawberries and other delicious desserts through the flowing “Chocolate Waterfall” and create Chocolate covered delicacies.